Communiqué international conference call service offers both local and toll free access options for connecting attendees worldwide. Make your international conference calls both secure and reliable using any type phone, anytime, from anywhere. When your employees, customers or partners span across different countries, we have multiple options for connecting global conference calling attendees. 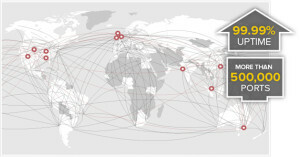 We provide service to over 33,000 customers located throughout USbb, Canada, and EMEA. Best price: Low conference call prices with no contract, set up fee, monthly fee, or minimum. Best service: Rank #1 Global Conference Provider by Wainhouse Research in 2012 & 2014. We provide live 24x7x365 fanatical customer service. Customer support centers based in North America, Europe and Asia provide local representation and in-country language (19 languages supported). Access from the most countries: Toll-free and local international conference calling numbers available in 107 countries worldwide. Quality & Reliability: We provide the highest quality global conferencing available. Redundant conference call facilities are distributed worldwide throughout 7 cities in the United States, 3 cities in Canada, and 6 cities throughout Europe, Asia Pacific, Latin America and South America. The service utilizes Dolby Voice® technology to deliver stunningly clear audio quality. Conference moderators can easily dial-out directly to international participants. Participants don’t incur long distance charges and it eliminates the need for conference organizers to distribute international numbers in advance. Toll Free and/or local international conference call access numbers are available in Asia, Europe, Middle East, Africa, Latin America, and North American countries. Maintain total meeting control right from your computer with active talker, mute/unmute, dial out to add participants, break out room control and chat. Host or join conference calls from iPhone, Android or Blackberry device. Hosts can control nearly every aspect of your call with a touch or a click. Communique audio conferencing comes with 24/7 support across the globe. Track calls by cost center, department or location. The information will appear on your monthly invoice. Experience matters. Communique is the worldwide conference call service leader. With 99.99% up time and 24/7/365 operator support, you can rely on Communique to for crystal clear sounding calls. For 14 years, Communique has been delivering reliable conferencing services to business, non-profit and government clients. Over 34,000 uses in over 34 countries trust Communique for their important conversations.